A motorcycle is simply the most cost effective transport option available. Owning and riding a motorcycle is not only more enjoyable, it can make a lot of financial sense too. We have selected a variety of vehicles in different makes and sizes from the 2018 RAC Vehicle Running Costs Reports and as you can see in the chart below, the motorbike comes out in front by a huge margin. 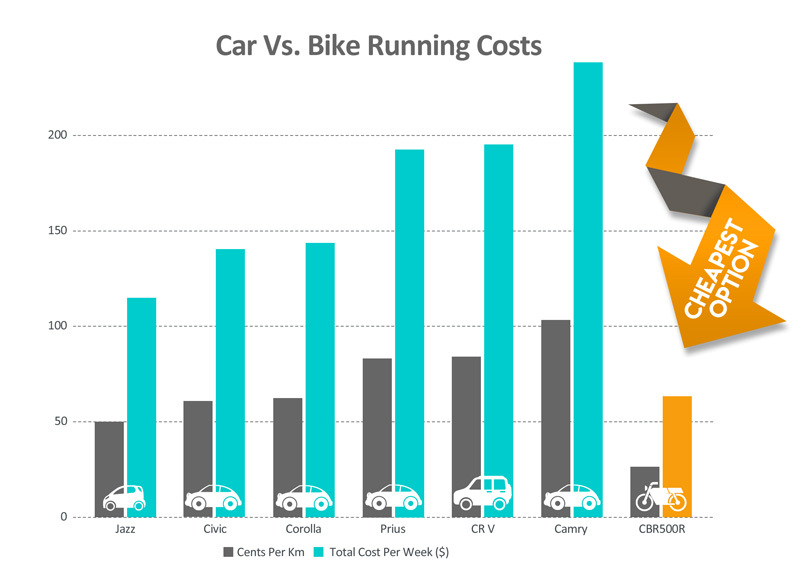 This is even before additional variables, such as the cost of parking, which can easily add another $50 per week to the cost of driving a car on average while many places offer free parking for bikes. Save money and have fun, it’s a win-win! As you can see the motorcycle is many times cheaper to own and operate than even the smallest and most efficient of cars. The savings are huge and over the life of the bike you will be miles in front. So, choose the smarter, more fun and better value option! – Check out our range of cost effective LAMS bikes here. Simply head to the link below, enter your email address and you will receive our FREE 14 page guide instantly!